We review 4 of the top performing miniature spy cameras available right now. You don't have to be James Bond to have a tiny camera these days! The quality of information that a surveillance operation uncovers is heavily dependent on the technology being used. Thankfully, we're now at a point where technology has realized the once far-fetched gadgets of the spy movies of the past. Wireless spy cameras are now available that are less than 1 inch in length, width, and depth! In today's guide we take a close look at the best tiny spy cameras currently on the market. We've reviewed each model and we tell you if they're worth your money or not. They may be small in stature but they're full of innovation and amazing technology. In this section we explain the key features that differentiate the top miniature cameras. The image resolution of a video camera is basically how many pixels it can display on screen (a pixel being the smallest unit of color a screen can show). The higher the resolution we have, the more detailed the image will be. The top mini spy cameras are capable of high definition (HD) recordings of 1920 x 1080p and in the case of the new GoPro, 4K resolution. 4K resolution isn't essential as regular HD is still very detailed but it could be a dealbreaker for those requiring the highest quality picture possible. Keep in mind that the higher resolution that you record in, the more battery life you will sap and the more memory you will consume too. A video is a series of still images that are replayed very quickly. The faster these images are played back, the smoother the video appears. The frame rate is the measure of how fast these images are replayed, and it's measured in frames per second (fps). The better (higher) the frame rate the smoother our video is to watch. The viewers are essentially tricked as our brains can't perceive the individual images as long as they are played faster than 12 fps. The frame rate of tiny spy cameras is generally always 30 fps. High-spec DSLRs can dwarf this, but when you consider that Hollywood movies are still mostly shot at 24 fps it doesn't seem bad at all. A frame rate of 30 fps gives a pretty smooth video recording, and it still amazes me that devices so small are capable of this. Cameras of this size are limited by MicroSD card capacity (as well as battery size). Therefore, to record in anything higher than 30 fps would just mean the card would fill up too quickly. This would affect recordings as the card would be constantly rewriting itself as it became full. Note: We've recently added the GoPro HERO 7 to our list. This shoots in an amazing 60 frames per second! Motion detection technology allows your camera to stay idle and conserve battery power until it detects movement in its field of view. It's the same type of technology that wildlife photographers use to good effect when setting up camera "traps" to get shots of elusive animals in the wild. It tends to be a pretty common feature among USB spy cameras. It really depends on your intended use as to whether it's an essential feature or not. What good is filming something that becomes invisible as soon as it gets slightly dark? Thankfully, night-vision is a pretty standard feature among micro cameras. They use infrared lights to illuminate the field of view so that the camera sensor picks up more brightness in times of low light. Infrared light is perfect for this job as it is invisible to our human eyes. That means the camera records a brighter picture back for us to view. The differences between the cameras are in how many IR lights the device uses for this job. The more lights the brighter the illumination at night. Technically speaking that should mean a more detailed night picture. However, this comes at the cost of battery life and therefore recording time too. These devices are limited by their battery sizes. As you would expect for something measuring around an inch in diameter, the actual battery isn't very big. This means recording times are less than what you would get from a standard video camera. They are also limited by their use of MicroSD as memory. Most include a feature that automatically starts recording again at the start of the session (writing over the old material) once the memory card fills up. This may or may not be useful depending on your intended use. Recording time is also limited by advanced features like night vision. Don't expect to get the same recording time at night, as the IR lights put considerable drain on the battery. The recording time will also be affected by the resolution and frame rate that you shoot in. Basically, the higher the video quality the more quickly the memory card will fill up and the battery will drain. If you're willing to sacrifice a bit on size and go for a slightly larger model (see our reviews) then you can get substantially more recording time. This feature isn't common but it's a real game changer. Having WiFi capability means that the action being filmed with the camera is viewable remotely using an app. That means you can watch the action unfold from wherever you may be (providing you have an internet signal). 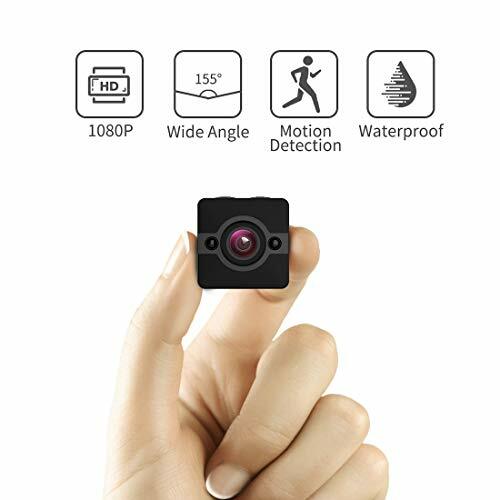 Upon the camera sensing movement in motion detection mode it will automatically send you an e-mail or notification with an image of the event. This function offers incredible levels of convenience and makes it a great tool for home security. The live streaming feature is a new one offered by GoPros. It lets you broadcast your experience as it happens to a live audience. These things are really tiny and they're not built to withstand rough treatment. However, some are more durable than others. Waterproof cases are available which make shooting in changeable weather much easier. You'll really have to treat them quite delicately though. These can all be mounted in different ways so it's important to consider your intended use and what the most convenient way to mount your camera will be. Some have a strong magnetic backing that allow them to stick to anything metallic, while some come with a special mounting bracket or clip that allow you to attach them to a solid surface. Some also have clothing clips that allow them to be attached to something like a trouser pocket, shirt pocket, or belt. How about a top spy microphone to go with that camera? We uncover which are worth buying in our new guide. In our opinion these are the 4 top miniature cameras on the market right now. Each model offers something slightly different and we feel they cover a good range of what's available. Following the comparison table we have individual reviews of each model. We discuss the features that make each model stand-out from the competition and why we think it deserves your attention. If you're unsure about any of the features then make sure you check out the buyer's guide. Now this isn't the smallest spy camera on our list, but it is the best in terms of video quality for its size. At just 2.5" (w) x 1.8" (h) x 1.3" (d) it's very much a micro camera and it's amazing how they packed so much into such a tiny object. First off, this can record in 4K HD video. This is the best video quality currently available and provides a ridiculous amount of detail and clarity. If that was't enough, you can also shoot your video at a super smooth 60 frames per second. These kinds of specs just shouldn't be available in such a tiny device, it's a remarkable feat of engineering that will never fail to impress you. But arguably, the video quality statistics aren't the most impressive thing about the new iteration of the popular GoPro series. The big new addition with the HERO 7 is the image stabilization. Coined 'HyperSmooth' it provides all the benefits of using a gimbal minus the extra size and physical inconvenience. The electronic stabilization cleverly predicts your movements and eliminates annoying camera shake. What you end up with is the smoothest looking action video outside of Hollywood. But, don't just take our word for it, take a look at the video below. Another brand new feature with the HERO 7 is live streaming. You can now broadcast your adventure to a live audience. Sadly, this doesn't currently work in 4K (only at 1080p at the time of writing but may change with a future software update) but it's still a really cool feature that allows you to share experiences like never before. Although it's very small, it's actually very tough too. It's waterproof to 10 meters and it'll stand up to being bumped and bruised in action too. Even if you do drop it you can still control it thanks to the voice control function. Simply tell it to start or stop recording or to take a picture and it'll do exactly as you commanded. The recording time depends on the quality that you shoot at. At full 4K resolution and 60fps you can expect around 1 hour and 20 minutes of video but you can increase this by lowering the quality. You can expand the battery life by purchasing an additional battery pack too. It's controlled with a simple touchscreen on the back. With simple swipe and tap gestures you can quickly select the required shooting modes. Besides impressive video it also takes high quality still pictures. The 12 MP photos are electronically enhanced using HDR, noise reduction, and tone mapping for vibrant and detailed stills. There's also a burst mode which takes 15 shots within a second. Bottom Line: It's not the smallest of our tiny spy camera compilation but if you can afford the extra size you won't regret it. The video quality is simply AMAZING. It's the perfect outdoor/action camera. 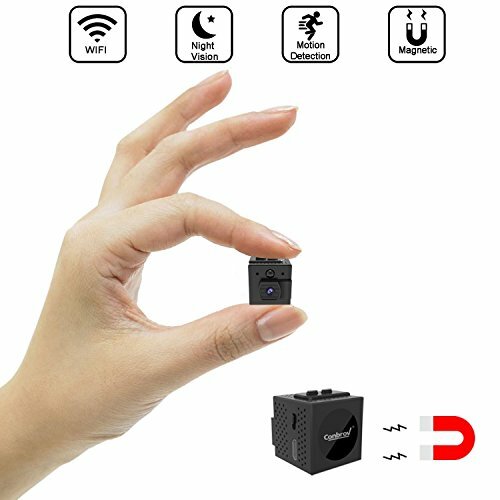 Conbrov proudly proclaim their mini camera as being, "the world's smallest WiFi camera". While I can't possibly prove this boast, I can say that it is indeed an absolutely tiny size for a WiFi enabled device. At just under an inch in length, width, and depth this futuristic cube has many talents. Let's start with the feature that sets it apart from the rest on our list, the WiFi. When paired with the accompanying smartphone/tablet app the camera can livestream a situation as it unfolds in real-time. This opens up a wealth of possibilities of use like monitoring a baby and for home security. It allows you to see what's going on outside your front door from the comfort of your bed or from the poolside while on holiday. But, it does still record in the traditional way using a MicroSD card too. It also supports loop recording where it will continue to record when the memory is full by writing over the oldest material. Like most of the micro cameras that we've recommended, this one features motion detection to spur into life when something moves in its view. However, being WiFi enabled allows this camera to take things to the next level of convenience. Upon something being detected by the camera, it will send the images to your phone or e-mail so that you know immediately if there is something suspicious taking place. A bit like having your own tiny cube of a security guard. It too makes the most of infrared illumination to give it decent low-light performance. The IR lights are only viewable by the camera and give a nighttime viewing resolution of 960p which is really impressive. On the note of resolution, this is the drawback with this model when compared to our other recommendations. While the others all record at 1920 x 1080p (at least), the Conbrov records video at 1280 x 960p. That means the image quality isn't going to be quite as crisp as the competition, but that's just the price you'll have to pay for WiFi connectivity. The battery performance is good for its size and it gives about 1 hour of footage when used portably. It can also be powered by USB for stationary use. A nice touch is the magnetic backing which allows it to easily attach to metal surfaces around the home. This removes a lot of the headaches associated with finding an appropriate place to mount a small camera like this. It's a thoughtful feature that shows Conbrov know their customers. It also comes with a 12-month warranty. Bottom Line: The smallest wifi spy camera we're aware of. The WiFi connectivity offers a new level of convenience that's hard to ignore. The 2nd smallest spy camera on the list, this device stands out from the rest due to its wide angled lens. The lens gives a 155 degree field of vision which is the widest of our recommended night vision spy cameras. It's perfect for surveying a large area and getting details of things like the layout of a room. Another great feature with the VOUO camera is the waterproof case it comes with. It's fully waterproof up to 30 meters in depth. There's no need to worry about the weather with this model, it'll take on the snow, sleet and rain no problem. The case does add to the overall size, but it opens up a wealth of new recording options. The statistics are otherwise pretty standard for a tiny video camera. It records in Full HD at 1920 x 1080p at 30 fps giving a decent video picture for something so small. It also has IR night vision and motion detection functionality. Bottom Line: The waterproof shell makes this perfect for outdoor recording. The wide angled lens is also great for surveying landscapes and large outdoor scenes. Now, this model is by far the largest of our picks. But, that's not to say it's big. It measures just 3.8" x 0.9" x 0.4" which by most people's standards is incredibly small for a video camera. However, this extra size allows a much bigger battery capacity, which in turn allows much more freedom when actually recording. The average recording time for the smallest spy cameras is around 60 minutes. Their tiny size just doesn't allow for a battery that provides any more. This larger USB spy camera uses a 900 mAh lithium-ion battery that gives up to 5 hours of high fidelity video. In motion-detection mode (it automatically records upon identifying movement) the battery will last for about a week. With these much less stringent time restraints on recording, the whole process is a bit less stressful. It records in as high a quality as most of the competition too. The 1920 x 1080p high definition video is played back at 30 frames per second, which is as smooth and as detailed as you'll find in a miniature camera. The video is recorded to a microSD card of up to 64GB in size, and can be set to auto-rewrite once the memory is full. It uses a USB interface for transferring the video data to a computer (you could eject the memory card too). Like the others on our list it can record at night using infrared light. Its 2 infrared lights don't offer the same degree of brightness as the 8 lights of the SOOSPY model, but the brightness and clarity are pretty good. Furthermore, you'll get much longer video recording time due to the bigger battery and it having less IR lights to power. Bottom Line: The enhanced recording time makes this stand it from the crowd. If one hour just isn't enough for you then this model deserves your attention. To bring our guide to tiny cameras to an end, we'll go over the key takeaways from the post. 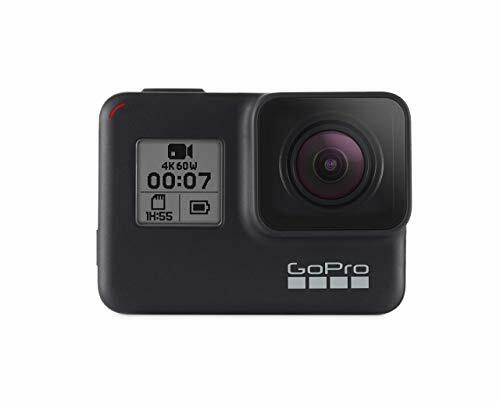 If you're looking for the best overall camera, the one that combines all the top features into a tiny package and delivers on performance, then go for the GoPro HERO 7. It doesn't have night vision or motion detection like the others but the video quality is unbeatable. It really is impressive! If you simply need the most unobtrusive and small spy camera of all then there's only one option for you. The Conbrov model is just minuscule! It might not be as refined as the more expensive GoPro but it's a fraction of the size. If the one hour recording time of the smallest cameras just doesn't cut it for you, then the PINBJY camera deserves your attention. It may be a bit bulkier but it's still small enough to remain concealed from view. That extra few hours of recording time makes life so much less stressful too. If you're on a strict budget and need the most cost effective solution then the VOUO model is a great choice. You'll be amazed that they even sell cameras this cheap! No, it's not going to blow your mind with image quality but as far as budget mini spy cams go there's not much out there that comes close to this. If you enjoyed this post then make sure to follow us on social media to see lots more like it in the future. There are links to our Facebook page in the top right of the page. It'll only take a second to 'Like' our official page. If Facebook isn't your thing then make sure you bookmark us as we've got more articles and guides coming thick and fast at StealthyNinjas.com over the next few weeks and months. As ever, if you have any questions about anything we've covered today or have any feedback on the site then please leave us a comment down below or over on the contact page. We promise to reply promptly. Check out our guide to the top kids spy gear next!